London Olympics 2012 is fast approaching, which is pretty exciting. It honestly feels like yesterday when our entire country cheered on swimmer Michael Phelps as he took home eight gold medals at Beijing in 2008. I touched a bit on the London Olympics in my article where Coca-Cola pledged it will make this year’s Olympics the greenest by recycling all soft drinks bottles that are disposed of at Olympic and Paralympic venues and return them into new bottles within six weeks. It got me thinking about how much the Olympics run on plastics throughout the entire games. “It was pleasing to see a start being made on the installation of the plastic sheet canopy and surround on the main stadium,” he stated. BPF said its members have won several contracts with the Olympics, which includes under floor heating, floor covering, and stadium seating. However, according to BPF, the use of plastics in the London 2012 Olympic Games isn’t limited to the materials and products used across its sites. “Hornby PLC, the models and collectibles group, have also secured a license to provide official London 2012 merchandise across its Corgi, Hornby, Scalextric and Airfix brands, which rely heavily on the use of plastics in their designs,” BPF stated. The Durakerb Group will supply both the North and the South Park with its Durakerb lightweight recycled plastic kerbing system. Durakerb is made from recycled PP and HDPE. Athletes will also sport plastics gear and even suit up in recycled plastic bottles. 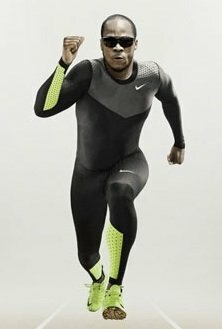 Sporting-goods giant Nike recently unveiled a new line of sportswear designed to help Olympians go faster, farther and longer, according to the company. Nike is manufacturing its 2012 Olympic kits using less material, and more recycled plastics, than in years past. The suits are made with 82% recycled polyester fabric, which is made from recycled plastic bottles. It takes an average of 13 bottles to create enough yarn for one uniform. The basketball uniforms are made from an average of 22 bottles and are 41% lighter than the uniforms worn at the 2008 Beijing Games. Dow Chemical, an Olympic sponsor, is producing a sustainable, polyester and polyethylene wrap that will encircle London’s Olympic Stadium during the Olympic and Paralympic Games, home to several athletic events, and the opening and closing ceremonies. The wrap will comprise of 336 individual panels – each approximately 25 meters high and 2.5 meters wide and will help the stadium become the visual centerpiece of the Olympic Park at game time, Dow stated. The wrap will include resins made by Dow’s performance plastics division and will be up to 35% lighter and have a lower carbon footprint when compared to conventional materials, according to the company. Dow’s involvement hasn’t been without controversy. Some say Dow shouldn’t be involved with the Olympics due to its links to a company accused in the 1984 gas leak in Bhopal, India. Dow bought that company involved 16 years after the 1984 accident that killed an estimated 15,000 people. Dow stated it was not responsible for the tragedy and that legal claims on the case in India have been settled. Still, the Olympics are going forward with the wrap, and Dow stated its products can be found all over the Olympics, even down to the track at the stadium. Those are just a few ways the plastics industry will have a presence at the Olympics. Tell us, which Olympic event are you most excited about?